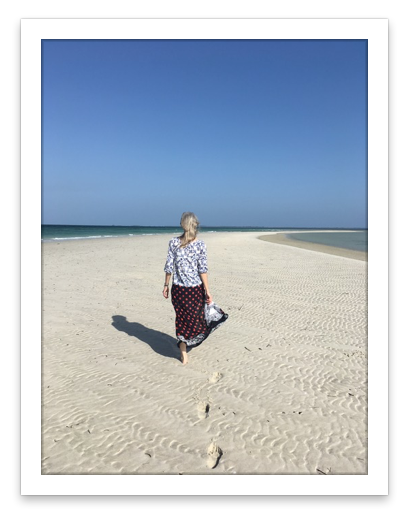 So early in 2018, I found myself back in Tanzania, after an absence of twenty years, on a planning mission for the yoga retreat. A quick flight from Zanzibar on the aptly named “Tropical Air” brought me to Mafia Island. Then a short drive across the island to Utende, where a boat was waiting to take us across to Chole. I had first visited in the mid 1990s, when Anne and Jean de Villiers were just beginning their venture on the island and I remember looking towards Chole and seeing red flame trees in the distance. Luckily I had returned at the right time of year and there were bright splashes of red visible among the green palms and baobabs. After a short crossing we landed and waded ashore through the crystal clear shallows. We were greeted with chilled, fresh coconuts to drink and then to get to the lodge, walked past a row of frangipani trees, along a shady forest path lined with ruins. Among the trees there are old warehouses, merchants’ houses and a Shia meeting house whose walls have been taken over by a sculptural maze of fig tree roots. This was once Chole Mjini, built by Arabs and Shirazi who traded and settled along the coast for centuries. The path branches off to seven tree houses scattered among the forest and in no time at all I was climbing up a wooden stepladder alongside a gigantic baobab trunk. Baobabs are described as vegetable elephants and the trees have a sense of massive, calm solidity. The tree house has two floors and from my king size bed on the first floor, I had an uninterrupted view out to sea over the mangroves. I was surrounded by trees – casuarina, palm, flame and frangipani, as well as the murmured conversations of palm doves. Chole has its own rhythm – you wake with the dawn and birdsong as the sunlight creeps softly through the canopy. The first morning, I watched the sun spread across the massive baobab trunk that was visible from my bed like a giant sundial. 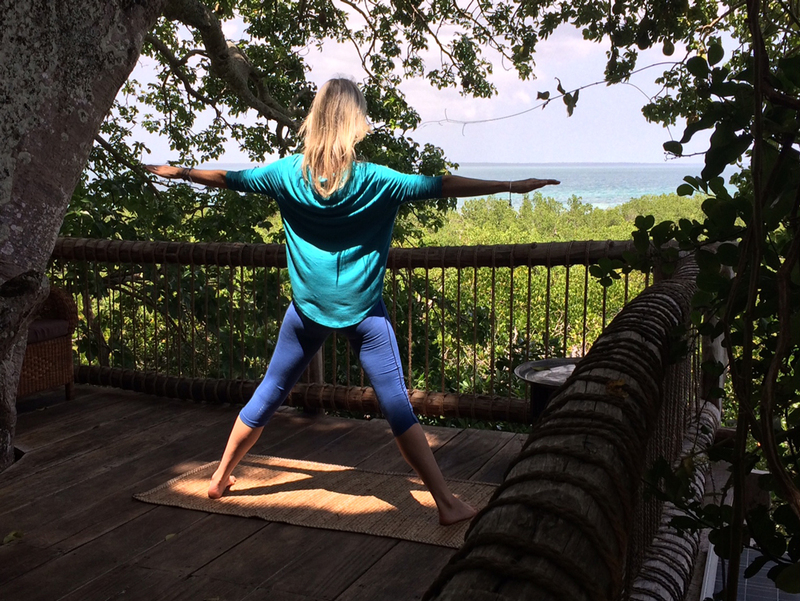 After a cup of tea in bed, the tree house was the perfect spot to do an early morning yoga practice. I put my mat down on wooden floorboards decorated with the flowers that had blown in during the night. It was an interesting challenge trying to contain the mind, whilst looking out to sea and watching the dhows sailing by. Then a breakfast of porridge topped with baobab powder, scrambled eggs and fresh fruit set out under a breathtaking flame tree. Two mornings involved waking before dawn to travel across to Mafia Island. It was no hardship to be up early, seeing the sun rising behind Chole, a gentle pink spreading across the sky as we sailed across to get to Anne and Jean’s other camp. Kitu Kiblu are involved with whale shark research and conservation. If you are lucky you may have the privilege of swimming alongside whale sharks, which come to the surface to feed on plankton during Kaskazi, the northerly monsoon. After heading far out to sea, the first whale shark we saw looked enormous to me but I was assured it was just a baby at around 6 metres, as they can grow up to 20 metres in length. Through the morning, far out in the Mafia Channel we saw another 7 or 8 bigger and bigger individuals. As instructed, I swam alongside their pectoral fin – you feel as if you get into their slipstream, close enough to appreciate their unique spot pattern and even look right into their eyes. Our last swim involved two whale sharks swimming in a figure of eight around us as they fed and swam in circles hoovering up plankton. It was an immense privilege to be accepted into their world. I found the whole experience so amazing that I had to take the opportunity to go again. This time the sharks were often a little deeper, rather than surface feeding. I had one swim with a whale shark whose enormous tail was moving like a pendulum just below me, in sync to the rhythm of my breath. I felt as if I could have just carried on swimming like that forever. While staying on Chole, other mornings were spent snorkeling in the marine park on coral reefs vivid with fish, reading in a hammock or strolling through the local village to see the boat building yard and the fruit bats roosting. I happened to be visiting on the day that the school students in the village were going to receive their text books at the beginning of the new school year. The books had been funded through the Chole Mjini Trust via a grant from the Waterloo Foundation. There was a large gathering of the village council, as well as teachers and students and speeches were made before the books were handed out. Chole Mjini lodge was initially set up with development and support of the village as priorities. When the project started in the 1990s there was only one teacher on the island, few resources and no one continued in education beyond primary school. Now both girls and boys continue on to secondary school and several Chole students have also gone on to university on the mainland. Chole Mjini Lodge’s Development Trust has also set up a Health Centre, a kindergarten, a Market and Community Centre, a Women’s Centre and a Learning Centre for adult education. Afternoons passed paddle boarding around the island, navigating in and out of narrow mangrove channels. 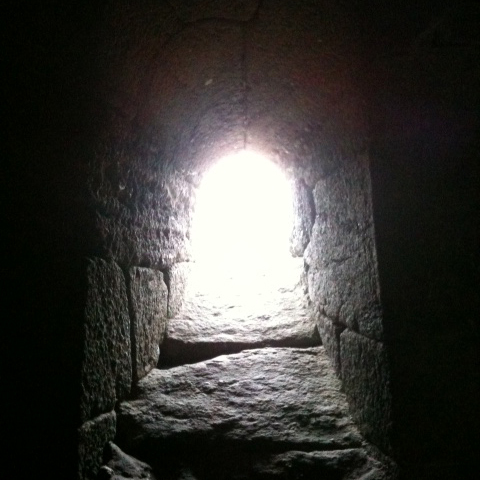 We sailed to the ancient ruins at Kua on the neighbouring island described as “the Pompeii of East Africa” and explored the palace, mosques and graveyards. When the tide was low, we sailed to a sandbank that emerged from the sea like a strip of white muslin. This was perfect for walking meditation – making the first footsteps on sand that had been washed clean by the tide. The only inhabitants were crabs who kept popping out of their burrows as I passed. As the sun sank lower, it was the perfect canvas to make giant yoga shadows on. Later in the afternoons, Anne and I spent time in the Boma, an imposing building near the slipway. This was partly built by the Omani Arabs and then extended and used as the old District Administrative Headquarters during German colonial times. It was a complete ruin the last time I visited but now in collaboration with the Department of Antiquities, Jean and his team have restored it, using mangrove, coral and limestone, traditional Swahili building methods. Anne and I christened the space for yoga and after some sessions I developed an individual practice for her to work with. This will be the venue for yoga on the retreat. One half of the building is open to the breeze on three sides, keeping it cool even at the hottest time of year. The other side faces the setting sun and is perfect for a later afternoon practice with pranayama and meditation. Yoga will frame the day with an early morning and before sunset practice and then people will be free to do their own thing, relax, read, have a massage, swim, bird-watch, sail or explore. Or just simply have time to be and watch the world go by from a hammock. After spending five nights on the island I felt as if I had slipped into an entirely different rhythm and pace of life. Up with the dawn and then to bed early, reading a page or two by the light of a solar lantern before enjoying drifting off to sleep watching fireflies bob past the mosquito net. Waking to the sound of the call to prayer from the village and then the voices of individual birds building to a chorus. Living entirely in the fresh air, surrounded by the sea. Chole is definitely not an easy place to leave. Especially when friends live there. As we sailed towards Mafia, I had a last look at the flame trees. It felt good to know I will be seeing them again soon…. November’s yoga retreat will be during whale shark season. I’m already counting the days.